inter- face between the antenna and the LNA gives different issues. One of this is if we treat LNA as a voltage amplifier we expect that the ideal value of its input impedance is infinity but from noise point of view, we require a transformation network to precede the LNA so as to obtain minimum noise figure. Figure below shows a 1.5 GHz CMOS LNA employing on chip and off chip inductors. 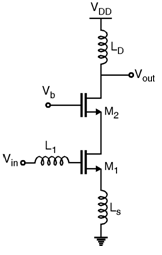 The transistor M2 plays two important roles by increasing the reverse isolation of the LNA first is it lowers leakage and second is it improves the stability of the circuit by minimizing the feedback from the output to the input.